The heap memory is the runtime data area from which the Java VM allocates memory for all class instances and arrays. The heap may be of a fixed or variable size. The garbage collector is an automatic memory management system that reclaims heap memory for objects. Tenured Generation or Old Gen: The pool containing objects that have existed for some time in the survivor space. Here's some documentation on how to use Jconsole. The new keyword allocates memory on the Java heap. The heap is the main pool of memory,accessible to the whole of the application. If there is not enough memory available to allocate for that object, the JVM attempts to reclaim some memory from the heap with a garbage collection. If it still cannot obtain enough memory, an OutOfMemoryError is thrown, and the JVM exits. The heap is split into several different sections, called generations. As objects survive more garbage collections, they are promoted into different generations. The older generations are not garbage collected as often. Because these objects have already proven to be longer lived, they are less likely to be garbage collected. When objects are first constructed, they are allocated in the Eden Space. If they survive a garbage collection, they are promoted to Survivor Space, and should they live long enough there, they are allocated to the Tenured Generation. This generation is garbage collected much less frequently. With Java8, non heap region no more contains PermGen but Metaspace, which is a major change in Java8, supposed to get rid of out of memory errors with java as metaspace size can be increased depending on the space required by jvm for class data. 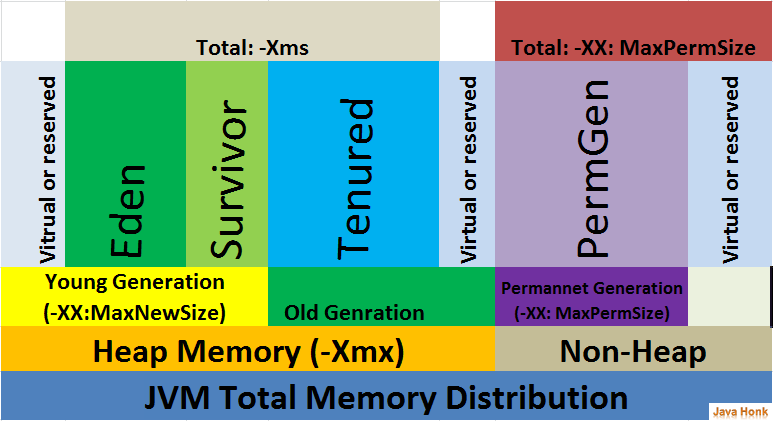 Java Heap Memory is part of memory allocated to JVM by Operating System. Objects reside in an area called the heap. The heap is created when the JVM starts up and may increase or decrease in size while the application runs. When the heap becomes full, garbage is collected. PermGen has been replaced with Metaspace since Java 8 release. Metaspace and Code Cache are part of non-heap memory. Codecache: The Java Virtual Machine (JVM) generates native code and stores it in a memory area called the codecache. The JVM generates native code for a variety of reasons, including for the dynamically generated interpreter loop, Java Native Interface (JNI) stubs, and for Java methods that are compiled into native code by the just-in-time (JIT) compiler. The JIT is by far the biggest user of the codecache. Not the answer you're looking for? Browse other questions tagged java memory pool or ask your own question. 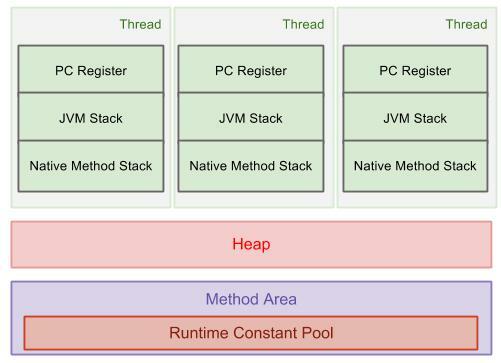 What is the difference between Java Non Heap Memory and Stack Memory? Are they Same if not what is the difference between them? How to analyze PermGen space? How measure used memory of java application?